Control of water management is more settled in poultry farming compared to practices in the pig industry. Drinking water is an essential nutrient for animals. Indeed, when the physiological animal’s requirements are not satisfied, performances can decrease and/or diseases may appear, both having an economic impact on pig and poultry production. In the field, waterline cleaning protocols seem more frequent on poultry farms than on pig farms. Is it a reality? Are poultry farmers more aware of water quality than pig producers? In order to update data concerning the different perceptions and practices for water management on pig and poultry farms, a study has been conducted to compare water supplies, their optimization and the different management practices for piglets in post weaning rooms and broiler chickens. 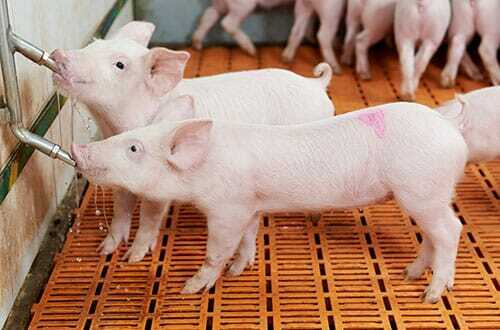 A survey was carried out on pig and poultry farms located in the West region of France. Twenty-five pig producers and 25 poultry farmers have been selected. A questionnaire was completed during an interview with farmers. The association between practices and the characteristics of the production has been analyzed with Khi-deux tests. In all the interviews, pig and poultry farmers stated that water quality is a main concern. Both bacteriological and chemical parameters are regarded as important for water quality, even if chemical analysis is less frequently performed. Water mainly comes from drilling (50% for both chickens and pigs). Sixty percent of pig farmers use continuous water disinfection (chlorination) whereas 80% of poultry farmers perform it with different disinfectants (the remaining 20% use tap water). Water is also an administration route for antibiotics, anthelmintics, vaccines and nutritional factors. Regarding sanitary status of animals, some recurrent diseases can be linked to unadapted water quality. Digestive disorders during the post-weaning period (82%) and lameness of birds (90%) are the most frequent disorders. For many criteria poultry farmers are more aware of water quality than pig farmers. The main differences in their practices concern the monitoring of water consumption and the water line maintenance (including cleaning measures to eliminate the biofilm). No pig farmers drain water lines while 72% of poultry farmers do. During the down period, all the poultry farmers set up protocols with mechanical and chemical procedures: 44% use flushing, draining, base, acid and disinfectant whereas 24 out of 25 pig farmers only clean the troughs in post-weaning rooms. This study underlined that the control of water management is more settled in poultry farming compared to the pig industry. These different treatments and maintenance practices could help to prevent digestive disorders in weaners and thus to reduce antibiotic consumption. Oral presentation made during the 24th International Pig Veterinary Society Congress (IPVS) in Ireland, June 2016. Research by M. Leblanc-Maridor and colleagues from INRA and Nantes-Atlantic College of veterinary medicine and food sciences and engineering, France.